I am part of a NZ Polish Addicts Facebook group and we have recently started up a weekly nail art challenge: Polish Addicts of NZ (PANZ) Nail Art Challenge. Feel free to join in on whatever online media you prefer such as Instagram, Twitter or Tumblr! Our hashtags are #PANZ and #PolishNZ. 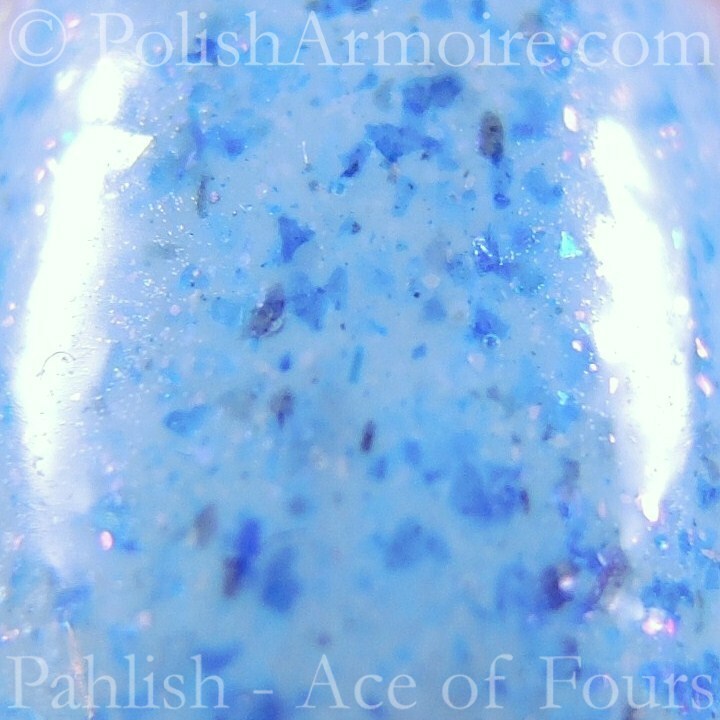 I decided to start off the mani with Ace of Fours by Pahlish which is a light blue crelly with grey and darker blue flakes and colour-shifting white/silver iridescent micro-flakie shimmer. You can see the flakie shimmer faintly on the top half of my index and middle fingers (click to zoom!) as well as in the macro below. 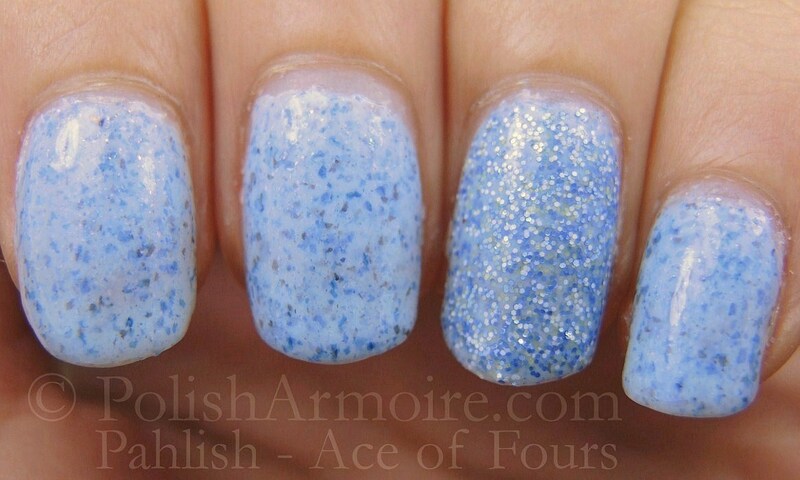 The shimmer was much more obvious in the bottle and 2-3 coats were required to reach opacity. I decided to layer one coat of Emily by Different Dimension over Ace of Fours for the accent nail. Emily contains tiny matte and metallic white, blue and pastel green hex glitter in a clear base though the green glitter isn’t very noticable in indoor lighting. My bottle also has a spattering of tiny red glitter and I wouldn’t have noticed it if one hadn’t ended up on my nail. I’m not sure whether that was intended or whether it was glitter contamination during production. Formulas on both were great overall. Emily had a thicker formula while Ace of Fours required careful application in terms of making sure you had enough polish on your brush. My photos do not truly represent how stunning these two polishes are in real life and they are both staying in my stash. I have also recently acquired Ice Queen by 365 Days of Color which is essentially a darker version of Ace of Fours. Sound off in the comments or on my Facebook page if you want me to post up a comparison post! Tags: Crelly, Glitter, PANZ, PolishNZ. Bookmark the permalink.